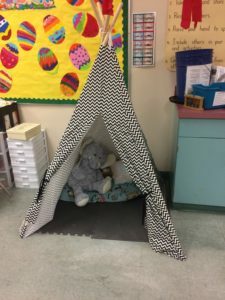 This new Calming Corner tent in a grade 2 classroom offers a safe place to use strategies and return to the Green Zone. Students helped redesign their classroom this week, creating a learning area in the middle of the room. Bean Bag chairs, soft lighting, classical music and other flexible seating options all contribute to a comfortable and “homey” feeling in the room. 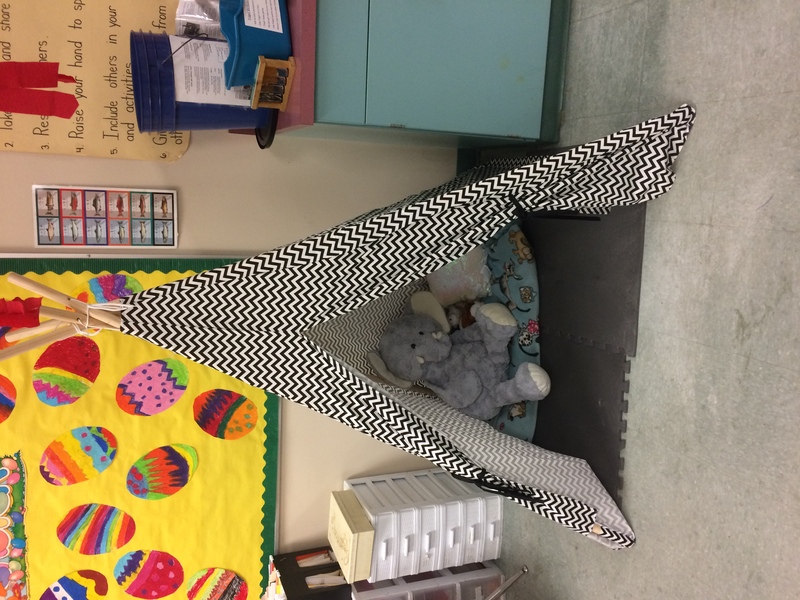 Students are excited to create their space together as a community of learners. vironment and reducing full flourescent lighting can be a tool in helping students return to and stay in the Green Zone (the optimal zone for learning), particularly after recess and lunch periods. You may notice teachers are adding flexible seating options, such as low seating or high stools, soft bean bag seating or rocking seats. 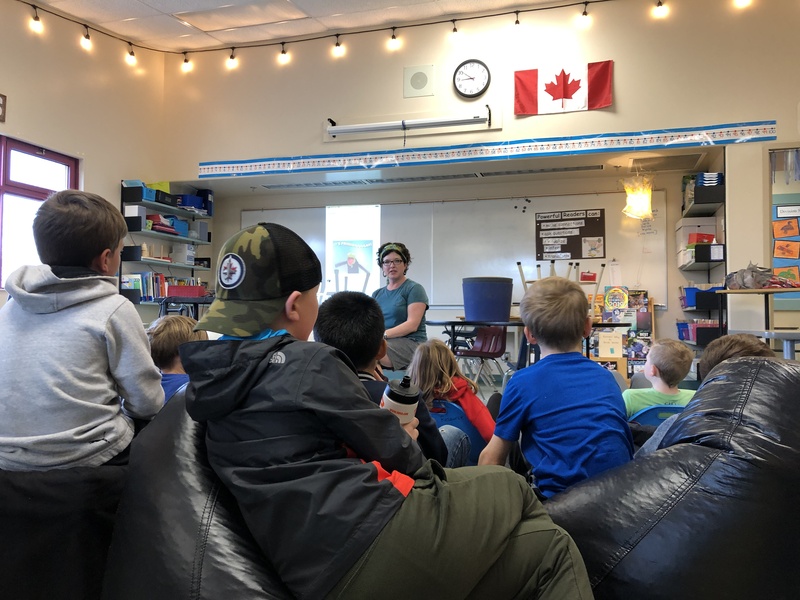 These seating options provide students the choice to select the most comfortable seat to allow them to stay focused on their learning and work. 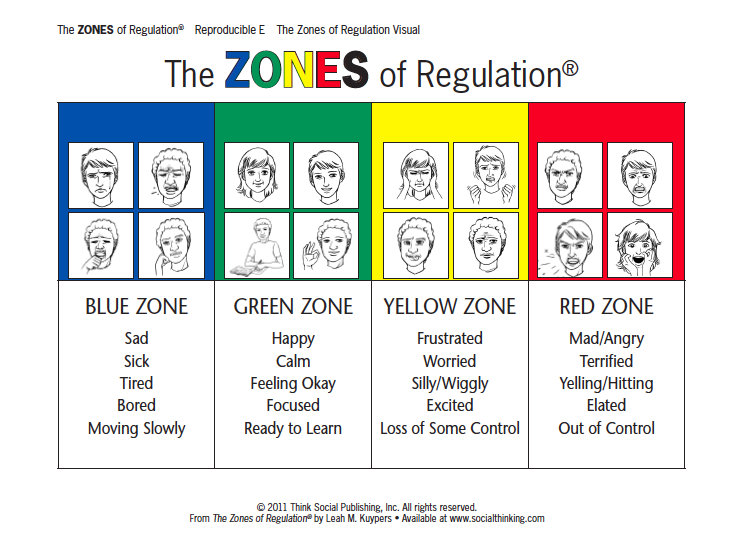 We continue to provide self-regulation structures, like Calming Corners, within the classroom so students can take a calming break if they are feeling like they are in the Blue or Yellow zone. We have some new furniture items to make these Calming Corners c ozy and safe for students who choose to use it. All of these structures and materials are proactive approaches to help kids get into and stay in the Green Zone so they can be successful, focused learners throughout the day! Kids have expressed that they really enjoy these new changes and additions. Students can bring their own bikes and helmets to school on these days. Bikes can be locked up at the bike rack in front of the school for safety. April 18 will be our class, team and siblings picture day. Siblings can be photographed as individual, pairs or a group. Please see the attached link to sign up for a shift during Fun Night. This event can’t happen without your help. Please sign up today! Each class has been asked to provide a themed gift basket which will be raffled off at Family Fun Night. You should have received a notice with what theme your class has been assigned. If you are not aware, please ask the teacher. We are asking each family to donate an item around $10 to go into this basket. There will be a signup sheet in your classroom where you can indicate what item you will be donating. Please do so no late than April 12th. Thank you for your support!! We are looking for donations for our Silent Auction. If you or anyone you know would like to donate an item please contact Debbie at debbiepatchett@hotmail.com or leave it with the office secretary Mrs. Holyoak. Items need to be in by April 15th. Thank you for your donation. You should have received a handout with a Ziplock Bag attached to it. We are asking that you fill this bag with fun stuff for kids from the dollar store. A few examples; stickers, erasers, bouncy balls, candy (must be in a wrapper) whatever you want! JAM your items into your ziplock….make sure it’s FULL. We will be collecting the stuffed ziplock from now until April 18th. There is a box in your classroom and in the office, please hand them in as soon as you can. Thank you for your donation. We are looking for $5 & $10 Gift Cards for game prizes and toys/games for our raffle draws. If you would like to donate any of these items you can drop off in the office or put in the PAC box before April 18th. Thank you for your donation! The Kids Plus Accident Insurance Program will be discontinued effective with the 2019/2020 school year. All policies currently in force for the 2018/2019 school year will remain in force until expiry on September 30, 2019. New applications for this policy year will continue to be accepted until May 31, 2019.